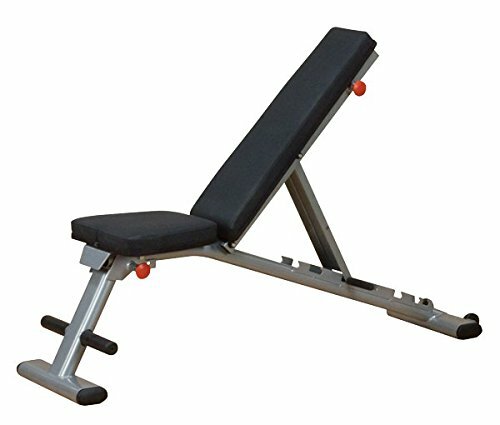 The Body Solid Weight Bench is a unique multi-bench that is one of the only weight benches in their niche that can fold down to be almost flat while offering incline, decline, and flat positions for training. However, what sort of features does it have in terms of exercise options, value for money, and adjustment settings. In this review, we will take a look at what this Body Solid weight bench has to offer so you can decide if this weight bench is the best weight bench for your budget and training goals. The back support and tapered seat provides adds a wider range of motion when exercising. Plus, the 7 adjustment options do a brilliant job supporting you when lifting heavy weights. No matter whether you are male or female, and have been training for years or have just started a weight training program, you can use this weight bench to improve your fitness program to strengthen your muscles. If you are looking for variety in your workouts, this weight bench is also a great option. 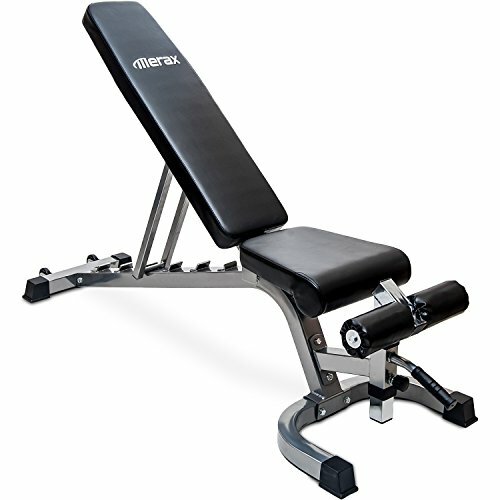 The Body Solid Weight Bench comes with padding that provides support and durability for your weight training. It is important to note that this bench does not come with weights, a bar, or a rack, all of which can be purchased separately. If you are looking for a bench with a various incline settings, a high weight capacity, and padded back supports that is also compact, the Body Solid weight bench is just what you are looking for. The tapered back support has a narrower top section and a wider section at the seat section. This gives you a great range of motion when training your shoulders and back, especially when doing pec flys and presses. The additional back support also limits the amount of strain placed on your back when lifting. The frame is made from 2×3 inch oval steel tubing that provides stability, strength, and durability, even when lifting very heavy weights. This unit has a weight limit of 1,000 pounds. The 2.5-inch thick back and seat padding provides great support that won’t let you down. There are transport wheels on the rear base stabilizer that make it easy to roll the weight bench to any location you want. You can roll it under a rock or a power cage with ease, plus you can store it simply. Thanks to the 7 adjustment positions, this weight bench is very versatile, allowing you to properly develop your upper body muscles from various angles, including incline and flat. The Body Solid GFID225 comes with a lifetime in-home warranty which is a great bonus for a weight bench that costs less than $300. In fact, thanks to this warranty, the high-quality frame, exceptional build quality, and the range of features and settings, this is one of the best weight benches you can get on the market. The only letdown is the lack of included lower body attachments, but these can be bought separately. By adding a set of weights and dumbbells, this bench becomes very diverse. You can easily train your glutes, quads, calves, and hamstrings. There are many different exercises you can perform on this weight bench even though it is a very simple unit. Due to the various positions that you can put the back in, the list of exercise is quite extensive. It is vital that you consult the user manual when looking at different training exercises to ensure that you do not injure or strain any of your muscles. Some of the many exercises that you perform include: pullovers, situps, presses, flys, curls, rows, lifts, and raises. This weight bench boasts a tough construction thanks to the strong vinyl material that is water resistant and easy to maintain. The 800 pound weight capacity gives you a lot of room to build your strength. The low-profile bench has been made with durable steel that provides you with solid support when training. The solid welded ladder adjuster at the back of the bench allows you to move between 6 angles ranging from decline, flat, and incline. This means you can work out different parts of your body doing the same exercises in different angled positions. There are also 4 base seat positions for varying heights. The dense foam pads provide a comfortable yet firm support when doing heavy lifting. If you are looking for a great all-round weight bench that will not break the bank but still offers you everything you need in terms of reliability, strength, and durability. In fact, Body Solid are so confident in their bench that they have added a lifetime warranty. While the bench does not come with any dumbbells or weights, these are easy enough to purchase. And thanks to the 1,000 pound weight limit, most likely you will hit your limit before you hit the bench’s limit. Incline vs Decline Bench Press: Which is Better? What Does Incline Bench Press Work? What Muscles Does A Bench Press Work? How To Increase Bench Press By 100 Pounds? Some recommended products may use affiliate links. MuscleKiss.com is a participant in the Amazon Services LLC Associates Program, an affiliate advertising program designed to provide a means for sites to earn advertising fees by advertising and linking to Amazon.com. Amazon and the Amazon logo are trademarks of Amazon.com, Inc or its affiliates. Copyright © 2018 Muscle Kiss | All Rights Reserved.